High Brightness LED market size was over USD 15 billion in 2015, and is likely to exceed revenue of USD 22 billion by 2023, at 4.9% CAGR. Increasing government focus on energy conservation is anticipated to drive growth in the coming years. High brightness LED bulbs market provides improved efficiency when compared to other types of lamps. These devices are robust and are likely to have higher life span when compared to conventional incandescent bulbs with life time range of 50,000 hours to 100,000 hours. They are one of the efficient lighting sources and thus enable in saving 50% to 70% of energy over traditional technologies. This in turn is expected to cut down carbon emissions and fuel the global high brightness LED market demand over the forecast period. Longer life span is likely to reduce the replacement cost and also the cost incurred in sending out maintenance crews. In addition, this property facilitates in installation of these devices in relatively inaccessible locations. Manufacturers are now focusing on low global high brightness LED market pricing strategy in order to boost demand over the next seven years. Growing application in heat sensitive applications such as textile and food illumination owing to absence of infrared radiation (IR) is expected to drive HB LED market growth from 2016 to 2023. Performance of these products is highly dependent on ambient temperature. Over-driving these devices in high temperatures is likely to overheat the LED package and this in turn may cause failure. Furthermore, they require adequate heat sinks for application in various sectors such as automotive, medical, and military applications. High initial cost as well as high price per lumen is likely to hamper acceptance across the industry. The high cost is due to relatively low lumen output power supplies as well as drive circuitry required. Cool-white LEDs emit significant more blue light when compared to the conventional outdoor light sources such as high-pressure sodium lamps. Blue pollution caused by these systems may pose a serious concern in coming years. Lighting application is anticipated to exceed USD 7.4 billion, growing at 6.0% CAGR from 2016 to 2023. The growth can be attributed to increased consumer confidence as well as continuous increase in sales of downlights, replacement lamps, commercial, outdoor and industrial products. The mobile segment is projected to hit USD 3.60 billion by 2023 growing at 5.1% over the forecast timeline. Surging adoption of mobile devices is expected to further boost demand over the next seven years. Asia Pacific high brightness LED market was valued at over USD 7 billion in 2015 and is forecast to grow at 5.5% CAGR from 2016 to 2023. Various countries such as Japan, China, and the U.S are now taking serious initiatives for energy conservation using LED lighting technology. For instance, the Chinese government is supporting the high brightness LED industry through attractive incentives, colossal financial subsidies, as well as assistance to improve manufacturing capacity of domestic LED companies. This is also anticipated to increase its focus on innovation as well as on upstream raw materials, as local producers are still dependent on international players for certain upstream MOCVD equipment and resources. Europe HB LED market share is forecast to exhibit exponential growth owing presence of large number of industries across the region. It is projected to grow at 4.4% CAGR from 2016 to 2023. Industry participants accumulating high brightness (HB) LED market share include Nichia, Kingbright Electronic, Broadcom, Cree, and Seoul Semiconductor. Other prominent industry players encapsulate OSRAM GmbH, Samsung Electronics, Sharp, and Moritex. Manufacturers are now targeting major industry players, brands as well as patents for strengthening overseas distribution channels and improve patent portfolio. In addition, several industry players are also modifying their business models in order to increase their prominence across the industry from 2016 to 2023. 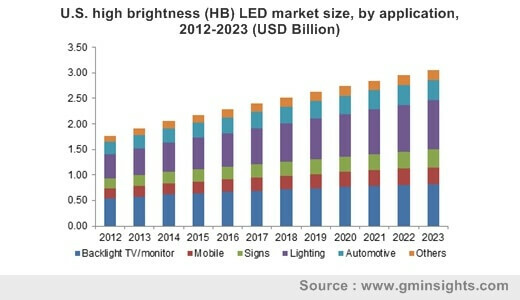 Bringing down high brightness LED market price trend may help overcome growth challenges through the forecast timeframe.